Design and secrets pretty much go hand in hand, some secrets below are obvious others not so much.Â Â I’ll whisper them otherwise we might get overheard and then they are no longer a secret right! Right then I say this a million times and excuse me for saying it again but you won’t create a truly memorable amazing interior unless you take risks – the more risks you take the more interesting a space becomes. The easiest thing to risk take on is colour, its also the most transformative. I won’t beg you to go dark (even though (a) its much more fun on this side and (b) dark rooms make you look skinner) all I will say is try and push it when it comes to colour. Ignore all that mumbo jumbo about the orientation of a room, north facing, west facing and all that nonsense (drives me bonkers that silly rule) or where in the world you are located – just push it with colour. Mix feminine with masculine – pretty obvious I know but if you havenât thought of it before it creates such an interesting dialogue. For instance I have a big velvet/tweed armchair which shouts gentleman’s drinking club and above it on the wall a dainty gold pineapple candelabra – it so works. Rooms that are too feminine have me running for the hills or pills which ever is nearer, rooms that are to masculine feel a little soulless so that mix for me at least is fundamental. Think outside of the box when it comes to choosing intended furniture. For example lets say you need a coffee table – don’t search for one instead go down the alternative route. Think about trunks orÂ African drums (which I use all the time as coffee tables) or if you like the look ofÂ occasional tables take the legsÂ down a bit, or (I could go on and on you know) grab a piece of MDF, wrap some zinc around it and put it on some sort of base. ItÂ ups the anty so to speak and doesn’t make everything feel so predictable. 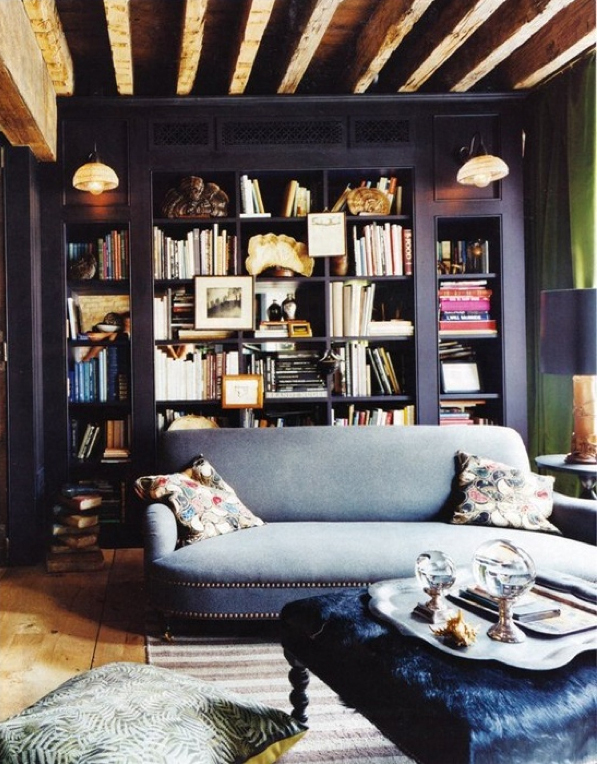 Use your walls – whether you layer them with art or bookshelves just use them, they take a space to a whole other level. If you don’t have enough books to fill a bookcase don’t worry about that – create a mini bar in them or plonk a painting over the shelves, no one will know. I could go on and on with the secrets but then we will be here forever and I have to dash to an early morning session of Pilates, feed and walk the two M’s if they ever fancy getting out of bed that is! Want to know more secrets? Fear not, lots more tricks and tips in my Design Classes. If you can’t make it to London or Australia (talking of Australia quickly new dates will go live in the next 10 days with a whole new class and added surprise cannot wait to tell you) then you can do the class online. How fabulous is that! Here foot stools double duty as coffee tables, and check out the art banged into the bookcase. Personally I would go bigger and bolder with the art but this is decorating you can do whatever you so won’t!